Transparency Market Research has published a new report titled, “Automotive Active Health Monitoring System Market - Global Industry Analysis, Size, Share, Growth, Trends, and Forecast, 2018–2026.” According to the report, the global automotive active health monitoring system market is projected to expand at a CAGR of 66.97% during the forecast period to reach US$ 6.7 Bn by 2026. According to the report, the global automotive active health monitoring system market is likely to be driven by a range of macroeconomic and industry-specific factors. Europe is expected to be at the forefront of global demand, with the market in the region is likely to expand at a CAGR of more than 58% between 2019 and 2026. The global automotive active health monitoring system market is witnessing significant expansion due to the increase in obese and diabetic population that requires frequent monitoring. 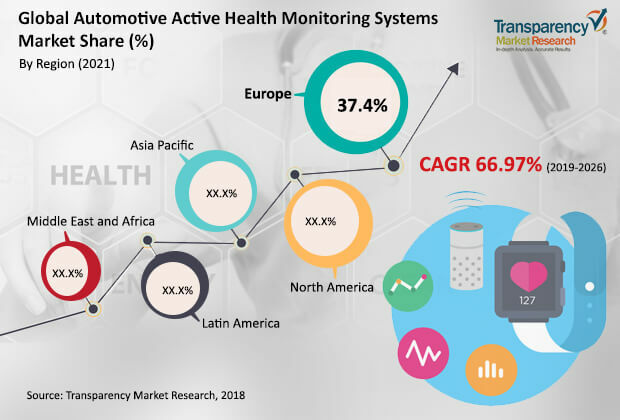 Rise in demand for safety features in vehicles and initiatives by governments and OEMs for product differentiation are augmenting the usage of active health monitoring system, which is anticipated to boost the global automotive active health monitoring system market during the forecast period. Expansion of the market is attributed to the increase in chronic illness across the globe owing to unhealthy lifestyle, poor diet, and increasing stress level. The leading cause of death in the U.S. is chronic diseases. In 2012, 117 million people had one or more chronic health conditions, and one in four adults had two or more chronic health conditions. Similarly, in Europe, chronic diseases is a major cause of road accidents-related mortality. According to the World Health Organization, in Europe, more than one-third of the population above the age of 15 has chronic diseases. Major OEMs such as Audi, BMW, Mercedes, Ford, Volkswagen, and Volvo are taking initiatives in driver health monitoring by providing features such as driver attention and drowsiness detection by using driving inputs, cameras, and biomedical sensors. These factors are likely to propel the active health monitoring system market during the forecast period. The global automotive active health monitoring system market has been segmented based on location, components, deployment type, application, sales channel, and vehicle. Several OEMs are focusing on the research and development of active health monitoring system on the vehicle seat type health monitoring. Hence, it is likely to be introduced before the dashboard health monitoring system. The dashboard segment is expanding at a higher growth rate due to the dashboard active health monitoring system’s integration in the vehicle and combination with other technologies such as active drowsiness system, which makes it highly cost-effective, as compared to the seat type active health monitoring system. The dashboard health monitoring system has comparatively more components; hence, it is more expensive. However, the dashboard segment is likely to expand at a rapid pace due to more functionality provided by the system. Consequently, the dashboard segment is likely to dominate the automotive active health monitoring system market during the forecast period. In terms of application, the pulse segment is expected to hold a major share of the market by the end of 2019, as compared to other application segments. Changing lifestyle, increase in daily travel, increase in workload, and change in food habits are major causes for health issues such as diabetes and high/low blood pressure. Based on components, the automotive active health monitoring system market can be divided into sensors and other important components, which include cameras, processors, and networks, and other systems that provide integrated health monitoring system for complete information of driver and passengers. Based on deployment type, the cloud-based segment is likely to expand at a higher growth rate owing its advantages over on-premises system such as data security and high storage capacity. The on-premises active health monitoring system has limited applications and it offers low storage capacity and limited working range. Therefore, the on-premises segment is likely to contract during the forecast period. Based on vehicle type, the passenger vehicle segment is projected to dominate the automotive active health monitoring system market during the forecast period. A majority of the OEMs are focusing on the development of the active health monitoring health system for passenger vehicles and autonomous vehicles. Therefore, the passenger vehicle segment likely to expand during the forecast period. In terms of region, Europe is expected to be a highly attractive market by the end of 2021, in terms of revenue, followed by North America and Asia Pacific. North America is likely to hold a prominent share of the market during the forecast period owing to the higher implementation of the active health monitoring system in vehicles in the U. S. People in North America and Europe are facing health issues such as obesity, high/low blood pressure, diabetes, and they need a system that can monitor the vital health signs of an individual. Prominent players operating in the global automotive active health monitoring system market include Faurecia, TATA Elxsi, and Plessey Semiconductors. Major OEMs such as Audi, BMW, Mercedes, Ford, Volkswagen, and Volvo are taking initiatives in driver health monitoring by providing features such as driver attention and drowsiness detection by using driving inputs, cameras, and biomedical sensors.